Has coffee become your life blood for your day-to-day work? Ever dropped by a Starbucks for a nice grande white chocolate mocha? (If you haven't, I highly recommend it as a pick-me-up and sweet tooth cure!) If you've ever been to a Starbucks in your life, you've probably noticed at least one or two five minutes apart from each other. But they didn't start that way; Starbucks grew organically from one small, local business in Seattle to a worldwide coffee giant in less than a few decades with little start-up money. Starbucks originally didn't sell brewed coffee and espresso, but coffee beans. Two teachers and a writer were inspired by Peet's Coffee and Tea in Berkeley, CA to start their own similar business, also selling coffee beans. As you probably know, teachers and writers typically don't make a JK Rowling salary, particularly not in the '70s. English teacher Jerry Baldwin, history teacher Zev Siegel, and writer Gordon Bowker were friends with Alfred Peet, founder of Peet's; with his blessing, the trio pooled together $8000 of their money plus loans to start up their own coffee bean venture in 1971. Nine years later, Starbucks was the largest coffee roaster in Washington and Siegel decided to pursue other dreams. To continue with their nautical theme, they made the logo a siren to evoke the sensuality of the sea. However, the logo evolved to a less "exposed" version not many years after. Though it fit rather well given their Seattle location and their name. Presently CEO of Starbucks, Schultz became a part of the team in 1982 as head of marketing because of his connection with Hammerplast, a Swedish company supplying Starbucks. His job was to spread the word and magic of Starbucks, searching for new tastes, flavors, campaign ideas, and whatever else boosts business. On a trip to Italy, Schultz sampled the delicious coffee and relished the refined cafe culture. Inspiration hit. Remember, Starbucks at this point was a coffee bean hub, not selling coffee by the cup as we know it now. When Schultz returned, Baldwin wasn't too keen on the idea of serving espresso as Schultz envisioned. In spite of the less-than-stellar feedback, Schultz believed in his idea and left the group in 1985 to start his own coffee business called Il Giornale, after a popular publication in Italy. Il Giornale was a success. Schultz earned enough money from investors that he up and bought Starbucks from Baldwin and Bowker for the huge sum of $3.7 million. By this time--about 1987--Baldwin had already bought Peet's and he still works there today. Talk about passion for coffee beans. Schultz's goal was to expand Starbucks to numerous locations, spreading out from Seattle. He consolidated Il Giornale and Starbucks into one business and the brand new company went public in 1992. Selling brewed coffee and tea by the cup was more than hit. Starbucks underwent massive growth in five years and continued exponential growth from there. Between 2007 and 2008, there were Starbucks shops opening every weekday! Yet, like every business susceptible to the currents of the economy, there were cutbacks worldwide. In spite of that, however, Starbucks is at home in 40+ countries and has over 15,000 total stores worldwide. People want the java. What can you take away from Starbucks' life story? 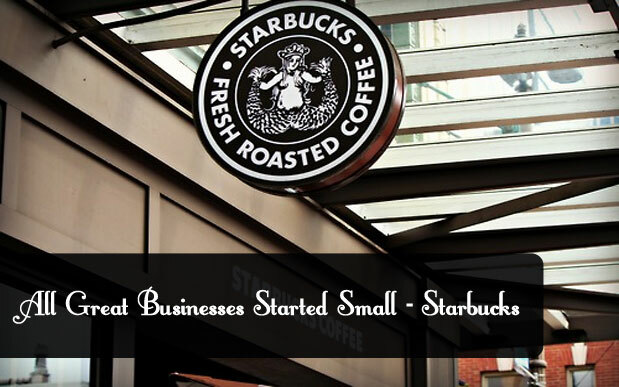 Starbucks started off small and local, just like your business. These three guys had no experience running a business previously--Siegel worked at Peet's for a year to learn the trade, but running one's own business is still a steep learning curve. More importantly, they were passionate about the business of coffee beans and roasting. Though Schultz came in later, he played an integral role in the metamorphosis of Starbucks as a whole. He too was struck by a fantastic idea and rolled with it. He followed what inspired him even if it meant deviating from his team. Now it's a coffee empire. What you should understand is that sometimes you just can't do it all alone. You may be able to act as manager, marketer, inventor, business(wo)man, etc., but it's definitely all right to have help. It might not be possible immediately, but after a while it might be worth it to partner or hire in order to achieve the goals you've set at a faster pace. Keep an open mind, network, and find someone you truly trust. This applies to investors as well. As cheesy as it sounds, stay true to what inspires you. Love the business you run. Always remember why you started your business and tap into that spark that drove you to take the small biz plunge. Next time you're sipping on your white chocolate mocha from Starbucks (wink), think about the company's evolution. Think on what success means to you and imagine your business achieving what you consider greatness. Nourish your inspiration. Tell us what you think of the story of Starbucks and what inspires you when running your business below, or tweet @Shopventory!